Looking for Shredding in Cork? Our ranges of paper shredding Cork security services are available to clients within the area. Our shredding services include On site Paper Shredding, Offsite, Onsite Document Destruction, Offsite Document Destruction, Products Destruction, Electronic Media and General Recycling Services. We are an award winning professional Shredding Company who possess an unblemished historic track record in the provision of confidential paper shredding services to our clients in Cork. Our paper shredding Cork services guarantee total confidentiality delivered through our professional, proven and experienced staff. 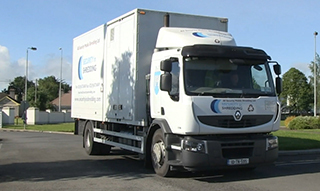 Our responsive On site Paper Shredding Cork Services cater for Client’s within the Cork region through our specially designed industry leading mobile shredding units. We guarantee full confidentiality and security with all of our innovative service deliveries throughout Cork. During our service delivery one of our paper shredding units will arrive onsite at the Client’s location in order to achieve the highest level of confidentiality during delivery. The innovation within our on site service delivery results in total destruction of the entire amount of the client’s confidential material without our specially trained staff touching or seeing any of the material. This point adds to the fact that our innovative systems are the most secure and confidential shredding systems within the market. The fully automated technology that we possess and utilise during the innovative paper shredding services is an additional illustration of how we have increased the level of security & satisfaction provided to the client (About us). Our clients receive full traceability of their material as we provide a Certificate of Destruction at the invoicing stage. This Certificate of Destruction is fully auditable which in turn protects the client to the maximum level post service delivery. Our Off site Shredding Cork Service is available to potential clients within The Cork Region. At Security in Shredding we the secure destruction of data is our number one priority and we strive to consistently improve the level of service quality available to all of our clients. Our secure offsite service involves our specially trained staff collecting the confidential material with our secure collection vehicles and transporting the material back to our premises. Our offsite service is provided with our ‘same day shred’ policy as we guarantee the confidential material will be destructed on the same day of collection. A certificate of destruction is provided to our clients at the invoicing stage providing the client with full auditable traceability post service delivery which is an additional extremely important point to our clients. At Security in Shredding the client is our highest priority and we ensure to work in line with all of the client’s needs and requirements in order to build a strong working relationship. This is another example of how we at strive to provide knowledge and awareness to our clients in order for them to be fully aware of the potential risks attached to certain service deliveries. In addition to the Onsite Services and Offsite Paper Shredding Cork Services we provide high security paper shredding clear outs “Purge” shredding services for clients who have both large and small quantities of confidential material that requires to be destructed beyond both recognition and reconstruction. This responsive shredding service if offered for client’s needs with both our Offsite Paper Collection & Same Day Service delivery and our On site delivery with little to no lead time. 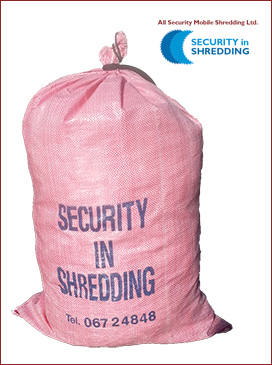 We are your number one service provider of high security confidential shredding in Cork. All of our confidential data destruction allows the client with the option of choosing a preferred and most suitable option of Secure Consoles, Secure Storage Sacks and/or Secure 240 Litre Receptacles. Please see our Product List for further information in relation to our products. For more information on our confidential shredding services in Cork please do not hesitate to contact us. Paper shredding Cork is a legislative responsibility for all Cork clients and it is essential that all Organisations abide by the European law in order to protect their image in their given markets. With new data protection legislation coming down the line for all European member Countries there will be an additional emphasis upon responsibly hiring Cork security shredding vendors. The times of receiving a certificate of destruction from any given organisation who offers paper shredding services may no longer acceptable from a compliance point of view for our clients. With the introduction of new legislation in addition to old legislation and increased levels of policing, clients of paper shredding need to ensure that their shredding service vendors meet the European requirements. Two fast methods of protecting your Organisation is to number 1; ensure that paper shredding Cork vendors are European Certified for Cork Security Shredding and number 2; ensure that the vendors are members of an Industry Association which provides additional security requirements and industry standards. In the case of an audit situation for a given client, it is imperative that vendors used by the client for paper shredding Cork meet industry standards. If this is not the case for Cork clients they are at serious risk of negligence in the case of a data breach that may occur during the process. Certificates of destruction are no longer the main method of compliance for clients as it differentiates the data on the paper from the paper itself. A simple certificate of destruction from a vendor may only state that X number of kilos of paper has been destroyed, this is not an accurate statement of data protection compliance for a client. The process of destroying data is a detailed and highly scrutinised activity which requires staff to be security screened and have detailed methodologies for all of their activities. The secure process needs to be the only activity on the given site also which differentiates waste operators from Data Processors. Whether you require an Offsite paper or an Onsite option, our team of dedicated staff will ensure that you have a pleasant and informative experience when completing your Cork security shredding service. Please do not hesitate to call our paper shredding Cork client care team and they will provide you with the relevant information to ensure that you are in compliance with European Legislation and not at risk of negligence with no obligations to our document destruction.